Each week or so I post a readable or watchable and/or a listenable of which I'm fond. You can choose what happens after my recommendation. Ignore, embrace, debate. Labor Day Edition: Wikipedia tells us Labor Day is a federal holiday celebrating the economic and social contributions of workers. Although, most of those who work retail, food service, transit or at hospitals will have to celebrate at work. I'll sleep an extra hour (on top of the 9) in your honor. The following are recommendations for those who work hard for the money. Do you know where I excel in the hierarchy of an organization? The middle. At the front line, I'm grumpy about having no input on my desk chair. At the top, I crumble under the pressure of having to supervise...anyone. A qualified therapist would tell me my inability to be a boss stems from being a latchkey key who only had to make an after school snack for herself. 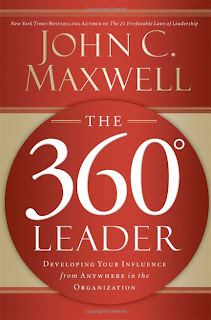 Enter one of my favorite leadership books: The 360º Leader by John Maxwell. I have a John Maxwell crush which is similar to my Michael Hyatt crush which is not similar to my Matt Damon crush. This great read first addresses 7 myths we often believe about leadership such as "I can't lead if I'm not at the top." Maxwell then outlines 23 principles on leading up, across and down. Hence, the circle of life. There are outstanding workplace movies: Office Space, Devil Wears Prada, Clerks, Working Girl, Anchorman. There are outstanding workplace TV shows: Mad Men, West Wing, 30 Rock, Sports Night and of course, The Office. Although I'm as much a fan of the original UK version AND I feel the current version has lost a bit of its way, I'll never adore a clip as much as this one. What are your favorite fictional workplaces?